Austin, Texas – TEKVOX has provided the infrastructure for the easy integration, control and security of multiple displays in the new Innovation Center at Trinity University, San Antonio. A roster of TEKVOX products play key roles in the collaborative space where they interact with third-party audio/visual systems to support a unique learning environment. Trinity University is a private, liberal arts college founded in 1869. 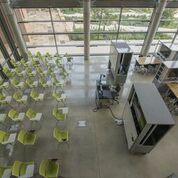 The Innovation Center is part of the Center for the Sciences and Innovation; it primarily serves as an engineering science and computer teaching lab. For the Innovation Center Miller chose both TEKVOX’s equipment and software: TekMonitor(tm), an Ethernet-based A/V control system; TekManager™and TekEnterprise™, management software that provides reports and the status of the AV systems on campus; TEKVOX 4K HDBaseT transmitter and receiver pairs; and the new TEK 4KDS-1 1080P scaler to provide top notch signal replication of images needed in the engineering sciences. The equipment is used across three zoned areas. The Teaching Area features two 60-inch 4K monitors facing 40 armchair desks. The displays not only allow 4K content – such as finely-detailed engineering schematics – to be shown, but also improve the image quality of the 1080P sources that comprise the bulk of the content. The Design Studio is a student lab area with ten mobile workstations outfitted with permanent and removable whiteboards, flat-screen displays, power outlets, data ports, storage, a custom worktable and a compartment to house the electronic equipment hardwired into the unit. On weekends and during the summer other groups access the design stations, which were created by Trinity University faculty and staff, led by Dr. Diana D. Glawe, Associate Professor in the Engineering Science department, working with Design and Assembly Concepts, Inc. True to its name, the Innovation Lounge offers soft seating and is an informal gathering place. In combination with the Design Studio, it has also hosted up to 250 guests for receptions. It features a large screen and projector and can display outputs from the Teaching Area and Design Studio. These three areas may be controlled individually or combined together under one system. “We are proud to be part of Trinity’s ongoing commitment to innovation in education,” says Jim Reinhart, TEKVOX CEO. “Trinity takes ultimate advantage of our integrated hardware and software solution as well as our extensive multi-vendor interoperability.